In this article, Trish Hill, principal of Oak Ridge, shares her thinking and the process that brought her to the plan to organize classrooms in “neighborhoods” next year. Throughout the planning and creating processes of bringing three schools together and creating one school, both Mr. Smith and I try to be very thoughtful and intentional about the decision making. One such decision was the question, “How are the classrooms going to be organized?” When we began this process, a major concern, particularly of parents who did not initially embrace the PreK-2 and the 3-6 model, was that there would be too many classrooms at the same level. They were feeling the loss of their small feeling, neighborhood schools, and expressed concerns about the how to maintain personalization of their child’s education. As a team, we listened to these concerns and made that an intentional focus as we conducted site visits to different districts. We specifically choose to visit schools with similar demographics that are comparable in size to what these new school schools would be. One question we asked, on behalf of those parent concerns, was: “How do you make a large school feel small?” One school grouped classrooms out of teacher convenience; another school grouped the children by grade level; and yet another created multi-age floors. When asked this question, “How do you make a large school feel small?” the school with multi-age groupings shared that they had grouped classrooms with two classes of each grade level in order to make the school feel small. 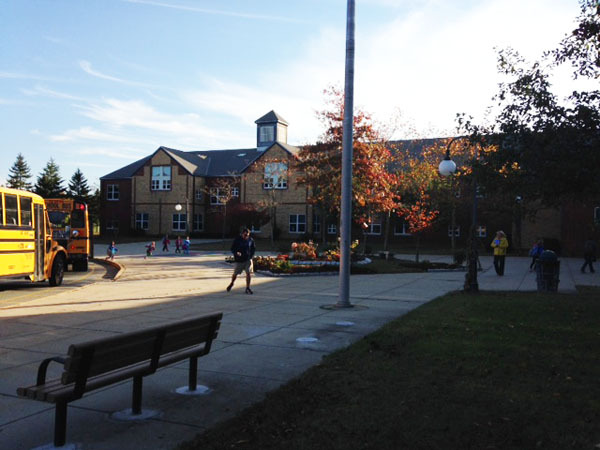 The site visit team members all noticed that this school did have a small, community feel. Where the first two configurations felt disjointed and institutional, the last configuration felt warm, kid centered and calm even though all three were a similar size. I can also share that as a middle level teacher and administrator, it has been my experience that a school grouping all of the students of the same grade level -even with teams – creates behavioral challenges. In the same school, the behavioral challenges did not exist when the school was grouped in multi-grade classes. Mixing grade levels increases teachers understanding of vertical alignment of curriculum, gives our 3rd graders role models, tempers the pre-teen behaviors of 6th grades (knowing they are the role models for the younger students) and gives more opportunities for projects like book buddies and reading to siblings, which was cited as an opportunity parents wanted for their children. That being said, one of the main reasons for bringing the students together was to encourage grade level consistency, grade level collaboration and opportunities for students to feel united. We wanted to break the barriers from “I’m an Oak Ridge kid, or a Forestdale kid or a Wing kid” to “I’m a Sandwich kid.” I believe we can do both! For the faculty, we will be creating opportunities for teachers to collaborate across the entire grade level through scheduling and looking at how we use time. We will be regularly using faculty meetings for grade level work. We will find opportunities to bring teachers together outside of their “neighborhood” groupings for the purpose of collaboration. We are also creating Team Leader positions for more effective communication between administration and faculty/staff. For students, it’s about being intentional with how we use time and create opportunities. We will be using the schedule to mix neighborhoods during lunch and recess, enrichments and field trips. It is certainly not the easiest way as an administrator, but it honors the wishes of both groups, the ones that wanted the schools to feel small and the ones that wanted more interaction among students. The teachers and administrators are very excited about the school we are “creating” for our 3rd-6th grade students. We’re excited about the vision and the mission, and are passionate about making every day full of learning and a sense of community for the students at the Oak Ridge Intermediate School!